I’m writing this post from my hotel room in Bali. It’s a lovely balmy evening, the kind of weather I grew up in and feel at home with. Outside, I can hear a live band singing an extra lively cover of Sublime’s Santeria. I’M RATHER OBSESSED WITH HOTEL BATHROOMS. It’s the first thing I head to right away when I enter a hotel room. And to some extent, I enjoy using the bathrooms much more than the sleep itself! It doesn’t matter how many other newer hotels have been sprouting in Singapore. 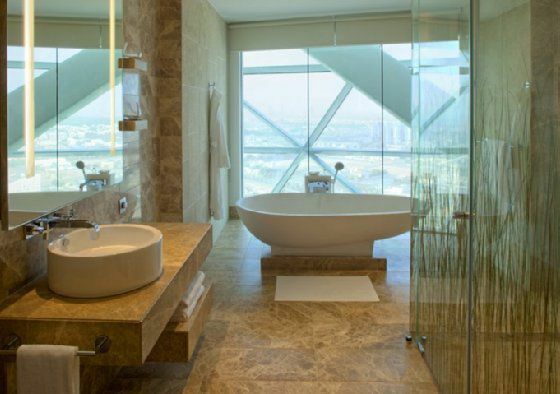 The view from the bathroom at the Ritz-Carlton is probably the best there is. 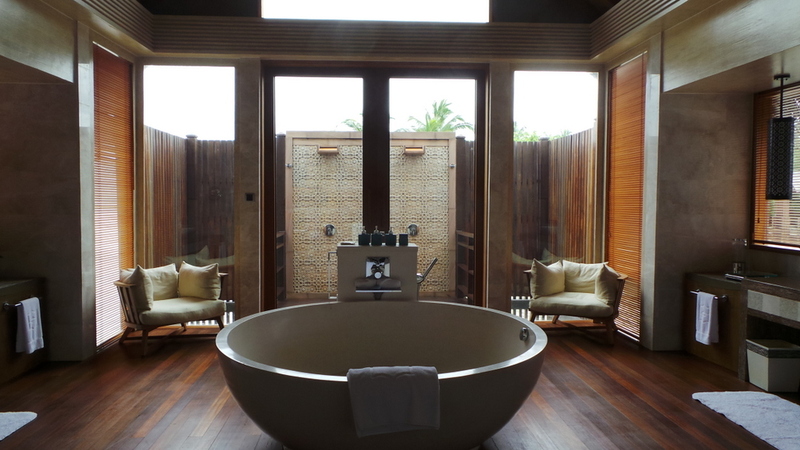 I’m not normally a fan of bath tubs but I did enjoy this particular tub + view. That’s part of the Eiffel Tower that’s faintly sticking up in the view. 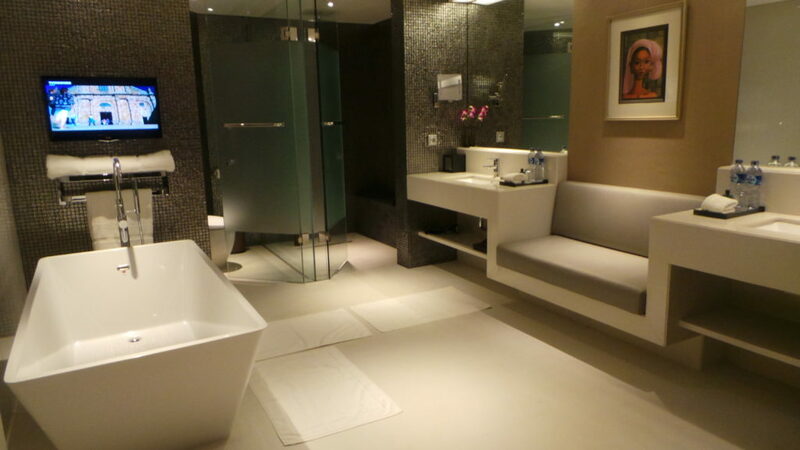 This bathroom is also one of the most spacious I’ve seen (This is a separate area just for the toilet). 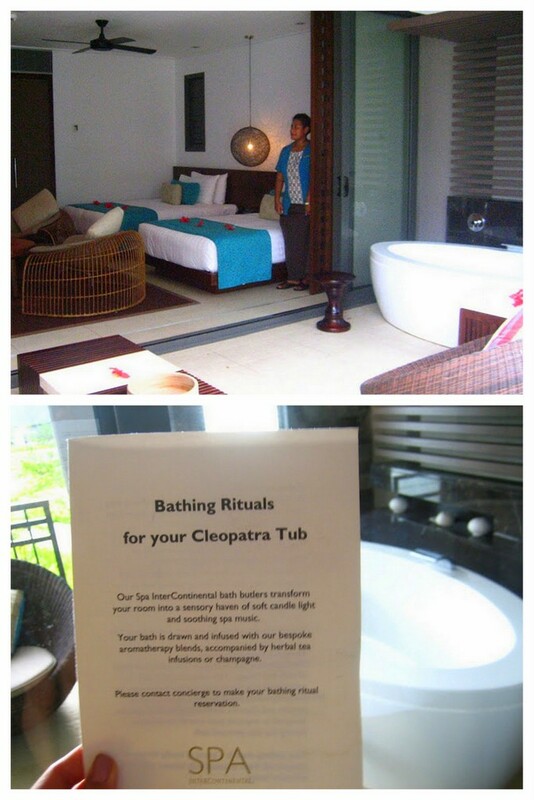 The size of the bathroom can easily fit another bedroom and I loved the spaciousness of it. 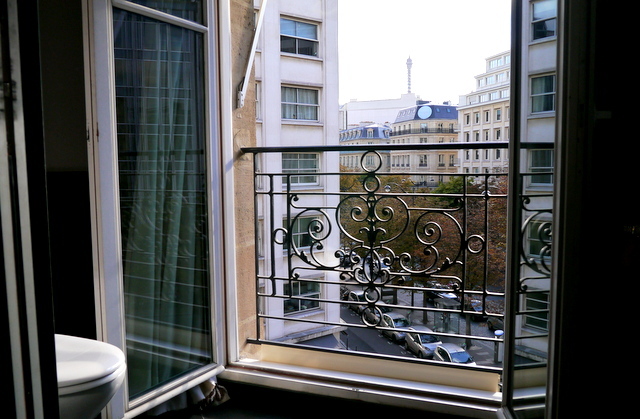 Of course, a loo with a view will definitely be high up on my list. First of all, that tub can fit in 6 people. It actually reminded me of a witch’s cauldron that perfectly fits people for cooking (er , yes these were the kinds of fairytales I read!). And then, the massive expanse of the entire bathroom with not just a side by side double sink, but a double sink opposite each other. 2 couches too, in case you want to hold a conversation in the bathroom. And best of all, as this is a Presidential Overwater Suite, the outdoor shower looks down to the ocean. This is the lead-in category room at the Park Hyatt Hotel & Villas. What I really loved and found amazing was the drainage system of the shower. It was almost invisible, and the shower floor was almost flat. The bathroom floor was also continuous with the bedroom floor so it was always cool to shower and feel that the water may flow through the bedroom and other open spaces of the bathroom but it remained neat! 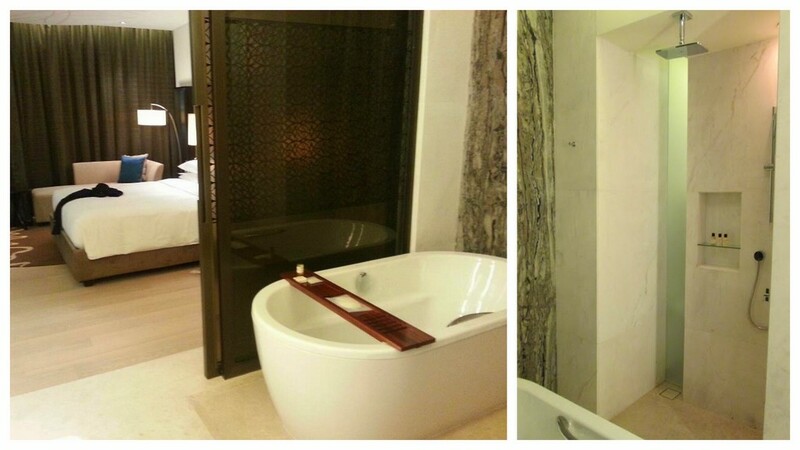 This is one of the best designed hotel bathrooms I’ve seen. 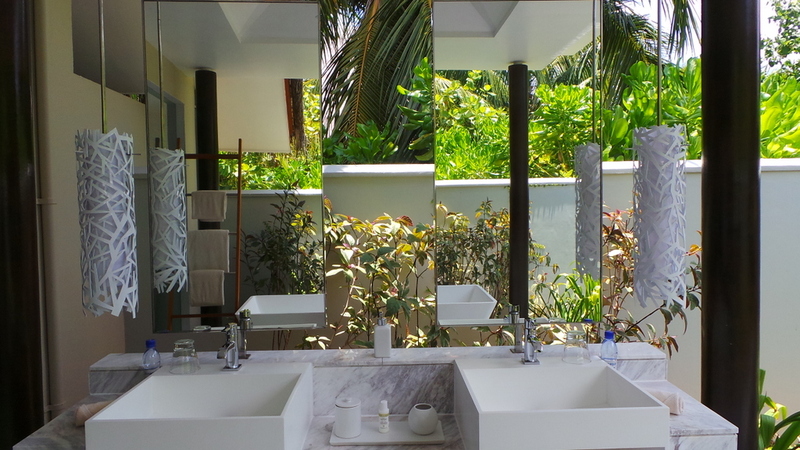 It’s not humongous compared to other Maldives bathrooms, but the way everything is laid out, including the huge open windows overlooking the Indian Ocean makes the experience really unforgettable. The hotel itself is an iconic, crooked ‘transparent’ tower famous in Abu Dhabi. So some of the bathrooms have a floor to ceiling open glass that over looks the city. The word “dazzling” comes to mind whenever I think of this bathroom. Nicely placed (and shaped) mirrors, what I liked most was the pull out vanity seat that transforms the sink in a vanity table , complete with great lighting too. This outdoor bathroom is so pretty it deserves 2 photographs! You will feel like you just walked in a personal outdoor spa with this one. Love the white coloured theme with the lush greenery. 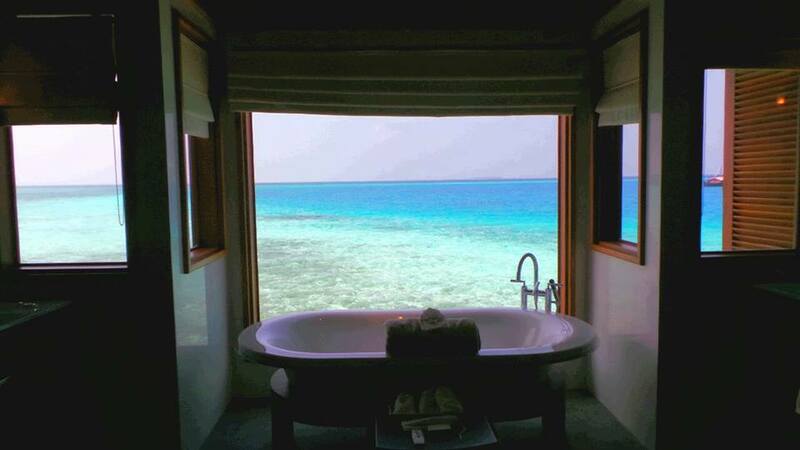 This is the bathroom for a beach bungalow type. It may not be overwater, but the outdoor bathroom will make you feel over the moon. My current location, where I also just spent a luxurious amount of time in the shower (As I’m travelling solo at the moment, there’s something quite indulgent with having the bathroom ALL TO YOURSELF 🙂 I love the couch area which to me, served very useful in placing clothes. 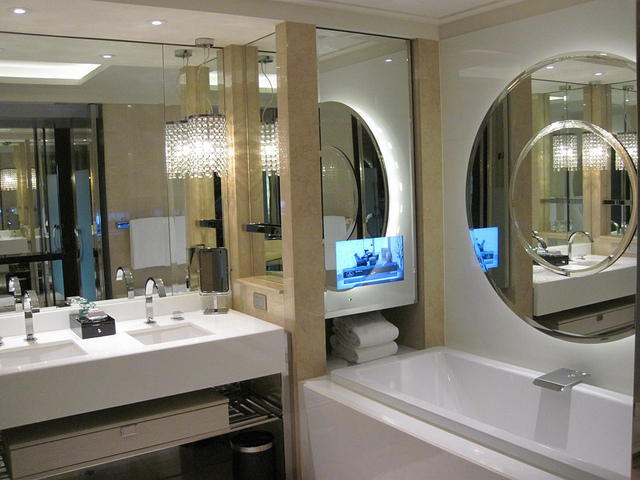 I just had to open this list again and add this magnificent hotel bathroom. The list is still growing and soon I will write a Part 2 segment of the topic. But what about you, are you a lover of hotel bathrooms as well? What aspect of a hotel are you very particular about? Now I do love a hotel bathroom… best recent was at Wolgan Valley, amazing views and huge bathroom, vast bath. 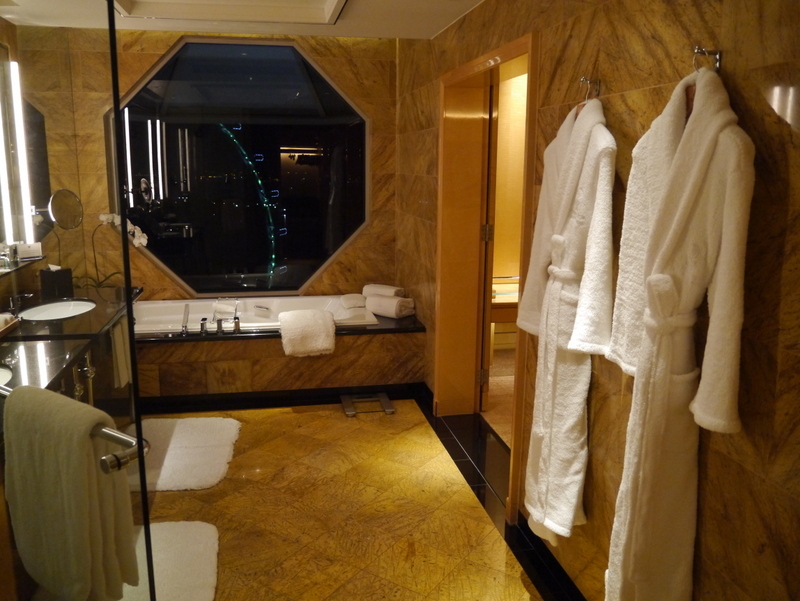 I loved an outdoors shower in a Bali villa, and the sheer luxury of the bathroom at the Jumeirah Beach Hotel in Dubai… and being alone in a sumptuous bathroom, just divine. Hi Seana, wow THE Wolgan Valley! I’ve only seen and heard marvellous things about that property. The photos do look so so out of this world amazing! And outdoor showers, they do give you a feel of being uninhibited and I love showering under the sun 🙂 I can also only imagine the luxurious feeling a Jumeirah property can give 🙂 Love your selections! 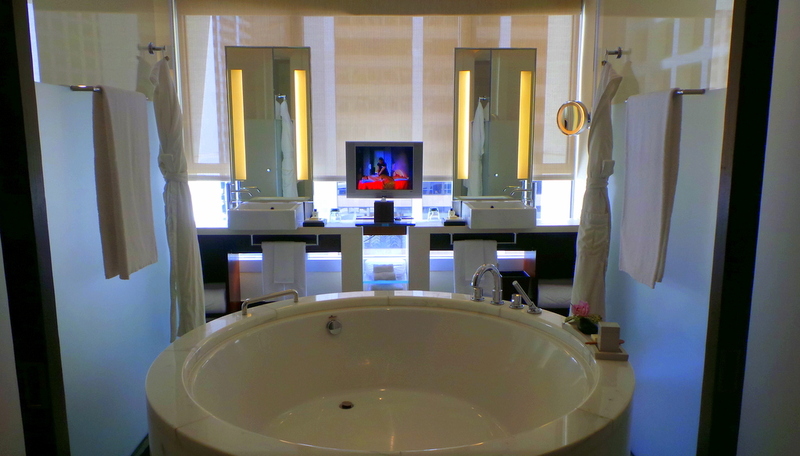 I recently stayed at W Hotel in Doha and the bathroom there was incredible- truly one of the nicest I have seen anywhere in the world. I loooove a great bathroom! It’s such an important room isn’t it? And these are some truly gorgeous ones Jean! Hi Anna, that London bathroom you stayed at sounds sooo pretty and epic!! And hey I know a couple of people who are also particular about linens! 🙂 you’re not the only one definitely. Speaking of the bed area, I also want fluffy and firm pillows! No limp ones please. 🙂 Have a great rest of the week! Such an inspiring post about the luxury hotels around the world, I enjoyed reading about the ones in Dubai and Abu Dhabi. Dubai is known as a famous luxury destination with lots of luxury hotels. The one at the Maldives looks really nice too. More than just a hotel, it is a paradise on the earth. Very nice hotels with spa.